As the year winds down, my sky scarf project—or should I say, "adventure"—is nearing its final rows. Here it is against the December 1 sky, measuring over 98 inches. I had a couple thoughts on finishing those loose ends... 1) weaving in the ends (yuck, not likely), 2) knotting them to form a decorative fringe, or 3) knitting and attaching an edging... what do you think? I bought some multi-colored yarn during one of the stops on my Fabric Rep Trek, but at 100 yards per hank (I have 3 hanks), I'm wondering how far it will go on an edge that will likely be 110 inches or more. 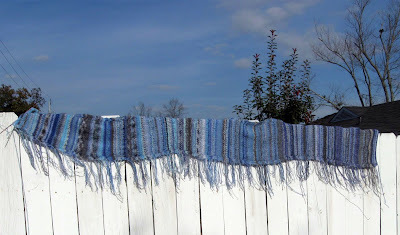 Put on your creative hats and tell me your suggestions and ideas for finishing this 365-day knitting project!